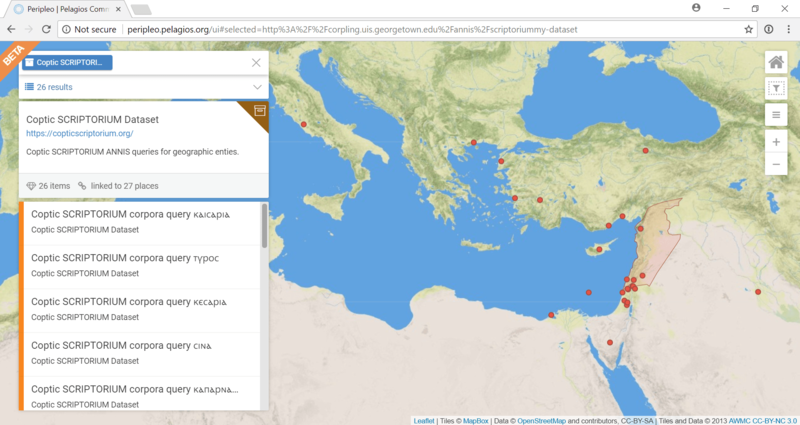 Coptic SCRIPTORIUM has partnered with Pelagios Commons to make geographic data drawn from published Coptic SCRIPTORIUM texts available via Pelagios’ Peripleo search engine and API. Each entry links a geographic location, identified by its Pleiades resource number, to a query for that term in ANNIS, our search and visualization interface. Therefore, each geographic entity in our data appears only once in the Pelagios data set, regardless of how many times the entity appears in our published texts. Queries cover corpora published as of April 2017 (release 2.3.1), including more recently published documents in those corpora, but do not include corpora new to our most recent release. The list of geographic entities included in this dataset dates to April 2017, and does not include locations unique to more recent publications. Turtle files prepared for this partnership are publicly available on GitHub: https://github.com/CopticScriptorium/pelagios-dataset-summary. This entry was posted in Digital Humanities, Scriptorium and tagged Coptic, digital humanities. Bookmark the permalink. ← New corpora – release 2.4.0 is out! Recent presentations by Coptic Scriptorium team members (post 1 of 2)! © 2019 Early Christian Monasticism in the Digital Age. All Rights Reserved.